Great to see an active forum with many inspiring stories, things to learn and people to meet. For starters, I'm posting on behalf of my brother who was the victim of a gunshot incident outside our home in Vancouver Canada last March. Jokes aside, I am posting his story in the hopes of finding similar cases in which the victim had the same/similar injuries and made strides towards living a "normal" lifestyle. We know that bullet fragments aren't a walk in the park, and there are all sorts of conflicting studies (should bullets be removed, exo skeleton rehab, neurological implications etc) but anything helps. 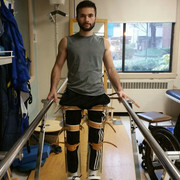 He's already been down to the Mayo Clinic, did some work with SuitX program and trains with the Paralympianian team regularly. This Summer he is booked for some trials at the Beyond Therapy program in Atlanta, but price tags make this a temporary fix. Hi Fortydays. Welcome. For many years I have read and believed that metal shrapnel poisons our bodies. I paid about $2000 to have my mercury tooth fillings removed, and experienced a definite improvement in my health. For now, I’ll just give you my own opinion, but if you want to PM me, I’ll do some searches and give you links to more information.